Not only is the Masai Mara one of the greatest wildlife reserves in Kenya, it is also unique in that it is not managed by the country's wildlife services but rather by the local communities. Located on Kenya's south western boundary with Tanzania the Masai Mara Reserve joins the Serengeti wildlife area to form possibly the most dramatic wilderness area on the continent. There are no fences separating where the two countries, Kenya and Tanzania meet, and no fences between the reserves and the surrounding private conservancies. Allowing free passage for all the wildlife, to continue to move from South to North and back again, as they have done for centuries. The Masai Mara Game Reserve, started as a small wildlife sanctuary 520 Km2 in 1948, it was extended eastwards in 1961 and went through some size variations before reaching the current size of 1,510 Km2 that it is today. The reserve originally got its name from the Maasai people who called the area “Mara” which in Maa (language of the Maasai) means ‘spotted’. This is exactly what the area looks like from afar. Great sweeping plains, spotted with umbrella acacia trees, bushes and animals. In the east are the sandy Ngama Hills covered in thick bush, favoured by the black rhino. The western border is demarcated by the Oloololo Escarpment. On the northern border is the Musiara Swamp, a great place for sighting elephant, lion, cheetah and leopard. 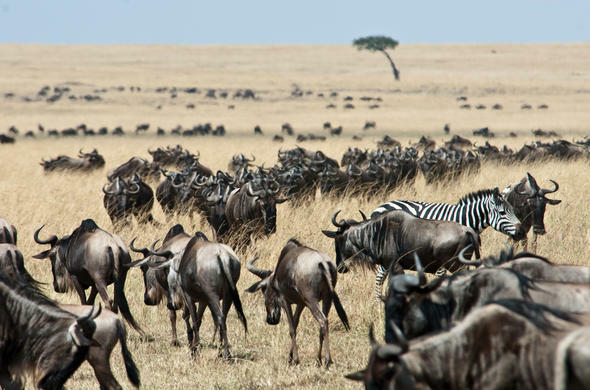 The Mara Triangle is bordered by the Mara River, which has lush grasslands, attracting high concentrations of wildebeest during the annual migration. The National Reserve's Mara Triangle is managed by the Trans-Mara County Council which is a non-profit organization and the more tourist-popular south eastern section is managed by the Narok County Council. These organizations are responsible for the protection of the wildlife and the anti-poaching units, as well as the tourism in the area. The Mara River originates in the Napuiyapi Swamp, in the Kenyan highlands, as the Amala and the Nyangores rivers, providing water for human and animal alike along its route. The two rivers converge to form the Mara River which flows through Africa's greatest wilderness areas including the Masai Mara and Serengeti before ending in Lake Victoria - but it is on its route through the Masai Mara where it hosts the most dramatic natural events on earth. The Mara River is the major water source in the Masai Mara National Reserve, providing water year round for the thousands of animals of the National Reserve, but it is in the months of late July to October that the river hosts the herds of the Great Migration - and the famous drama-filled river crossings. Giant Crocodiles wait all year for the herds to cross the Mara, and when they do, the Crocodiles feast. It cannot be said with certainty where Wildebeest will cross the Mara River, but they generally choose more placidly flowing areas, although these areas may well be longer and more dangerous because of the Crocodiles. It can even happen that the herds will gather on the edge of the river for hours and then suddenly move away without crossing. The Masai Mara ecosystem contains around 25% of Kenya’s wildlife; much of this wildlife is found outside of the actual reserve in rangelands. These rangelands belong to a variety of landowners, some private individuals, some belong to communities and some to groups of individuals on lands that were formerly community land and have since been subdivided. Many of these land owners are pastoralists, traditional Maasai. These lands comprise most of the ancient migratory corridors bordering the famous tourist attraction, the Masai Mara. Should the landowners ever decide to fence them off and use their land for agriculture the country's wildlife would be greatly diminished. The various Mara conservancies have all evolved independently, although they all operate a similar conservation model: leasing land from the Maasai landowners, reinvesting tourism revenue to the communities and ecosystems, and creating a desirable tourist destination. This means that there is a win win situation for all involved; the wildlife and ecosystem is conserved, the local communities benefit directly from the tourism, and the tourists have a beautiful destination to continue to be able to see Africa’s wildlife as it has been since ancient times. Currently five conservancies have committed to this initiative. Situated on the northern most point of the Greater Mara Ecosystem, running along the Mara River. There is a large number of giraffe and plains animals and resident buffalo that live near the boundary. There is a resident pride of lion that have their territory inside the conservancy. Also hippos and crocodiles are numerous along the river, and leopards are found in the riverine forests. Rare species like aardvark, caracal and aardwolf are also occasionally found here. They also focus on cattle management programmes working in conjunction with the local community. Located adjacent to the Masai Mara Reserve, is a private conservancy, with a high concentration of wildlife encounters. Big cats are found in impressive numbers as are elephants, giraffe and wildebeest. This conservancy offers exclusivity and also protects and empowers the local Maasai community by channelling a large part of the conservancy fees paid by tourists back into the community. This is a non for profit company, made up of a partnership of twelve member camps and 788 Maasai landowners. They provide world class commitment to the environment, wildlife and local communities. It borders the Masai Mara Reserve, and is one of the most populated wildlife areas within the Masai Mara. It is home to Leopard Gorge, a birthing and maternity ground for big cats made famous by the BBC’s “Big Cat Diary”. Also a good place to view the highly endangered wild dogs. During the Loita Hills migration (Dec to May) thousands of wildebeest come to Mara North. The first conservancy in the Mara ecosystem where an area of 8,000 acres of community land was set aside for wildlife with no human settlements and cattle. The conservancy is now 17,500 acres and belongs to the Maasai community, who set aside their land for wildlife conservation, providing them with returns to help them improve their lives and not be solely dependant of cattle. There is a resident pride of over 30 lions, leopards and numerous other animals, plus over 300 species of birds. With only two camps with a total of 15 tents on this conservancy you can enjoy the wildlife without the crowds. In May 2006 a deal was brokered with 277 Maasai landowners and this conservancy was formed, bordering the Masai Mara Reserve.They offer high quality low traffic safaris. The Maasai people have agreed to move their homes from the area and only allow managed cattle grazing, leaving the wildlife unimpeded. As a result the wildlife population and diversity has improved in the area. There are now good populations of predators and herbivores, including big cats and elephants.